Yamaji Art is an emerging Aboriginal art centre in Western Australia. We provide professional services for artists with a focus on sustaining cultural maintenance and arts practice in a variety of mediums including painting, textiles, weaving, print-making, design and performance. 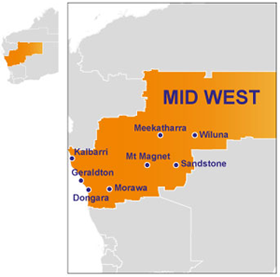 Yamaji Art has a huge service area that extends through Yamaji Country covering the greater Mid-West region of Western Australia including the Lower Murchison towns of Morawa, Mullewa and Northampton. Yamaji Art represents artists from more than five broad Cultural groups from the region: Amangu, Nhanagardi, Naaguja, Badimaya, Wajarri, Wilunyu and as a contemporary urban based art centre, represents others currently residing in Geraldton or the region, including Nyoongar, Yinggarda and Ngaanyatjarra artists. This diversity of artists ensures that art centre has an extensive range of styles including dots and lines, and almost everything in between. Yamaji Art Centre is based in Geraldton, a port city four hours from Perth. The centre includes a gallery and sales outlet plus an artists studio and workshop. Many of the works produced are still available for sale in our shop. Works produced by Yamaji Art artists have been showcased in exhibitions nationally and overseas. Yamaji Art Centre is a membership based organisation run to create economic benefit for Aboriginal artists from or currently residing in the Midwest, on Yamaji Country. The art centre is governed by the Mara Arts Aboriginal Corporation (MAAC) which has evolved from the Marra Gallery orignally founded in 2000 as Marra Aboriginal Corporation. Yamaji Art’s core funding is received through the Australian Government’s Indigenous Visual Arts Industry Support program. We are also supported by the State Arts Commercialisation Strategy which is housed in the Department of Indigenous Affairs. Yamaji Art Centre is also funded by commission from artwork sales.